Two high-end Canadian tourism companies are adding space to their list of exotic destinations. Adventure Travel Company (ATC), in Toronto, and Montreal-based Uniktour will offer amateur astronauts rides on the suborbital Lynx spacecraft under development by Mojave, Calif-based XCOR Aerospace. The companies, which offer personalized safaris and the like for well-to-do clients, are acting as agencies for Space Exploration Corp. (SXC). The Dutch marketing firm is selling Lynx tickets on behalf of XCOR, most notably for men's personal care product company AXE. SXC chief commercial officer Reinhard Spronk said the move is a nod to the Canadian public's large interest in space, which is partly a result of the media attention paid to the nation's off-Earth robotics program, which contributed the huge Canadarm2 robotic arm and other assets to the International Space Station. 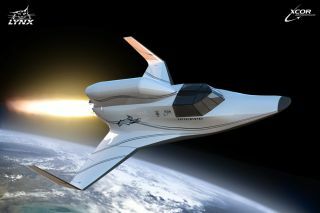 XCOR aims to get the first tourists into its Lynx space plane by the end of this year for high-altitude flights, and then offer regular suborbital flights above 62 miles (100 kilometers) in 2014. Spronk said XCOR has a history of meeting its posted expectations. "They're reliable," he said, adding that the vehicle's rocket engines have been tested thousands of times and are ready to be put on the Lynx spaceship. The wings and cockpit will be installed in the coming months. Uniktour's president, Philippe Bergeron, places so much faith in the technology that he plans to take the inaugural Uniktour test flight aboard a Lynx spacecraft himself in late 2013. "It's the only technology in the world that allows rocket engines to open and shut during the flight," Bergeron told SPACE.com. Uniktour ticket sales opened Feb. 1, and the firm has made two sales. Its primary market is in the Canadian province of Quebec; in the coming months, it will likely expand marketing to France, where a major shareholder is located. ATC, which is marketing to the rest of Canada, is entering final negotiations with about a dozen customers since opening sales Feb. 5, Spronk said. More could be coming shortly. There's a substantial price difference between the two firms: Uniktour's tickets range between $95,000 and $100,000, while ATC's offerings start at $142,000 Canadian ($141,840 at current conversion rates). ATC's package includes a longer hotel stay and training, Spronk explained. Uniktour's clients can purchase training separately. XCOR is running against rival Virgin Galactic to fly tourists to suborbital space first in the next couple of years. Several Canadians are among the roughly 550 customers who have signed up for a ride on Virgin Galactic's SpaceShipTwo, which will cost $200,000 per seat. XCOR's Lynx spacecraft will carry one passenger and one pilot per flight, flying up to four times a day from a conventional space runway. XCOR now has 205 customers standing in line for Lynx flights, Spronk said. Sales opened in April 2011, he added, and have accelerated in recent months as the flight date approaches. Most of SXC's Lynx clients are in mainland Europe, but the firm will ramp up marketing shortly in their "priority countries" of the United States, China, Russia, Brazil and the United Kingdom. XCOR has kept fairly quiet about flight milestones since announcing its marketing partnershipwith SXC in mid-2012. "Space, in a certain era, was something you saw and you were amazed [by], but perhaps you didn't feel like you were really going to be the one to participate in," Andrew Nelson, XCOR's chief operating officer, said in June 2012. "But now, we can transfer ourselves into the faces and the names and the sights that we're seeing develop in front of us," Nelson added. "I think it's going to revolutionize the way we view space, the way we approach space, the way we create new industries."